A few weekends ago, Jay and I decided it was time to declutter and organize the storage room in our basement. This room has served many purposes over the years, and it had been organizationally neglected for many of those years. The time had come to dig in and get ‘er done. Motivation. You’ve got to be ready and motivated to get it done. A vision or goal for the area to be organized. This doesn’t have to be crystal clear at the get go. Simply knowing what is working, and what isn’t, gives you enough clarity to move forward. A simple organizing process to follow. I use the organizing process I developed for classes like The FUNdamentals of Getting Organized and Organize Your Closet. This process takes the guess work out of how to navigate organizing projects—even the big and overwhelming ones. Focus. You’ll be most successful when getting organized if you focus on one project, or one small area of a project during a single organizing session. Time. Make organizing appointments with yourself, just as you would if a professional organizer were coming to your home to help you. Make sure this time is as interruption free as possible by making childcare arrangements (if necessary) and eliminating distractions from your phone, Facebook, T.V., etc. Someone to help or bounce ideas around with. 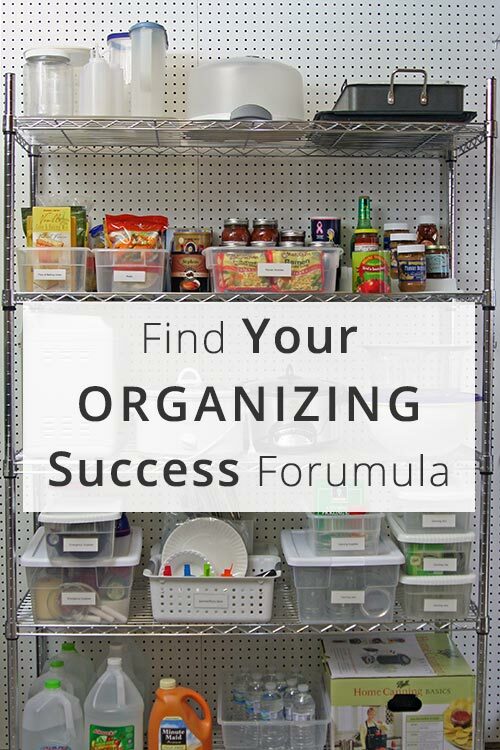 If you have trouble letting go of items, or get overwhelmed while organizing, this one is huge! An extra head can help you think things through so you don’t get stuck or overwhelmed by your project. This formula works great for me, and helped me navigate my way through a successful basement organizing project. (It looks and feels soooo much better!) The key, however, is to figure out what works for you. What needs to be in place for you to make progress? If you aren’t sure, give the ideas above a try and as you do, notice what works and what doesn’t. Keep doing what works, and brainstorm new ways to address those pieces that don’t work for you. P.P.S. Sign up for the Organize-athon by April 3rd to get a free copy of my Declutter To Make Room for a Better Life mini-guide. Also, if you need a simple-to-follow organizing process, check out the deal we’re offering on The FUNdamentals of Getting Organized. This sounds like just what I need. Your timing is perfect. I’m halfway finished with the Streamline Your Closet video course that was part of your Spring Cleaning Bundle. It works well with your own video and .pdf class, Organize Your Closet. A real, live, online class with you, Aby – what a great way to go into spring here! It definitely feels more like autumn here today but I look forward to a nice organizing boost to celebrate spring. To use a phrase I remember from the expert guided classes (the ones that followed a set timeframe): I’m in!! I love that you make organization about what works for you. This philosophy is what creates success! Organizing and purging is also more fun when you have somebody to give you an unbias opinion. Great post and thanks for sharing!